President Donald Trump speaks to the media as he tours the U.S.–Mexico border on Thursday. BROOKE GLADSTONE: And I'm Brooke Gladstone. PRESIDENT DONALD TRUMP: I don't know if we're walking or flying but either one is OK with me. We're going to see a lot [END CLIP]. BROOKE GLADSTONE: Earlier in the week, Trump reportedly dismissed his trip to the border city of McAllen, Texas as a photo op. That he was doing only because his team advised him to. Certainly, this latest national press event isn't the first McAllen has hosted. In fact, the city of 140,000 has become something of a border backdrop for political fact finding missions. 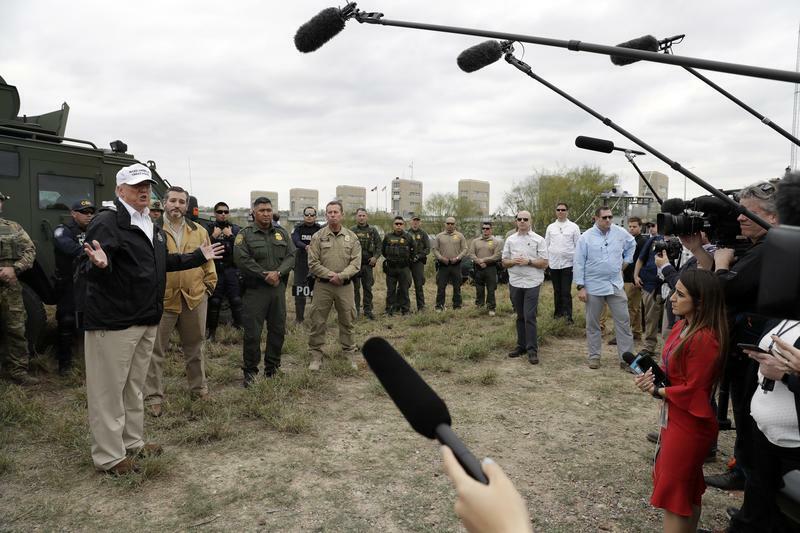 MALE CORRESPONDENT: On a surprise trip to McAllen, Texas, First Lady Melania Trump visited the frontlines in her husband's battle over illegal immigration. 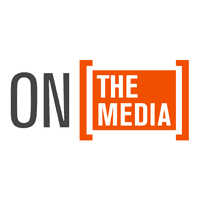 MALE CORRESPONDENT: In McAllen, Texas, a group of Democratic legislators visited several facilities that hold children. MALE CORRESPONDENT: I was on the border this weekend down in McAllen. I sat down with the chief of the Border Patrol--. BROOKE GLADSTONE: That was Sean Hannity visiting with, then Governor, Rick Perry in 2014, when McAllen first entered the national consciousness around immigration. It was then that nearly 70,000 unaccompanied children were apprehended at the border. A 77 percent increase over 2013. Most of the crossings were in the Rio Grande Valley, so it put McAllen on the map as detention facilities overflowed. BROOKE GLADSTONE: Then Secretary of Homeland Security Jeh Johnson. BROOKE GLADSTONE: Rick Perry and other Republicans called on President Obama to go see the horrors for himself. He declined. BROOKE GLADSTONE: In the intervening years, and notably last summer when Trump's Zero Tolerance Policy was used to separate children from their parents, McAllen has seen plenty of political visitors. Lorenzo Zazueta-Castro covers immigration for The Monitor newspaper in McAllen. He says that at this point, whether it's Trump or Congressman Beto O'Rourke, there's a pattern to these border tours. For example, the obligatory stop at the border patrol station. LORENZO ZAZUETA: From there they're usually taken to somewhere along the river. So a levee area and then ends up to a park, which butts up against the river. Most Republican politicians will get that or a tour to the river itself or they'll though jump on a boat with the big guns. LORENZO ZAZUETA: To go out on the river and have Border Patrol point out spots to them. BROOKE GLADSTONE: Where some undocumented people are entering the country, not through an official point of entry? LORENZO ZAZUETA: Yeah. This is a common tour that someone like Senator Ted Cruz will take. Those are the types of tours that Democrats stay away from. They will do the tour with border patrol where they're along the fencing around–that kind of thing. That's pretty standard. What you do see from Democrats, specifically, is people going over to the respite center. LORENZO ZAZUETA: Any person that was in that detention center, the a few days before and processed, they go to the respite center. They get dropped off by Border Patrol. There they get a shower, change clothes, food and they get to reach out to relatives, friends and try to set up a plan to their next destination. They could have anywhere from 20 people a day to 500. LORENZO ZAZUETA: There's two new centers that opened up this year. LORENZO ZAZUETA: But before, it was just one. I've been to the respite center many times over the course of my time here and speaking with people who are at the respite center, temporarily, first thing they'll say is, 'we were treated like dogs in the other place and now here, we feel like people again.' And they're referring to being in the detention center for the couple days that they are being processed. BROOKE GLADSTONE: Are we talking about the detention facility called Ursula, which is the largest in the country? LORENZO ZAZUETA: Correct. Ursula is the detention facility that most of the people that come into this sector stay at or are processed through. BROOKE GLADSTONE: How would you contrast Ursula with the respite center? LORENZO ZAZUETA: Oh, night and day, there's no comparison. These people are undocumented. These people have already been given a court date for their illegal entry charge–the misdemeanor. They are so grateful for the help that they're getting. A lot of them volunteered to help out other people who arrived that day. Obviously, they empathize with what they're going through. So, there's a lot of communal feeling. BROOKE GLADSTONE: Are there any especially scenic stretches of border wall in McAllen that Trump stood in front of in this photo op or might have stood in front of? LORENZO ZAZUETA: Ah, no he didn't do that. There are areas that have fencing--. BROOKE GLADSTONE: And are we talking about big beautiful concrete or big beautiful metal? LORENZO ZAZUETA: Well, it's both. I think that's another one of those things about semantics with the construction and what the administration wants. You have about 10 feet of concrete and then on top of that you have the slabs of steel that go inside that concrete to fortify that barrier. BROOKE GLADSTONE: The construction you're talking about isn't specifically related to the president's current proposal for the border wall that has closed down the government because there seems to be funding for it already. LORENZO ZAZUETA: Correct. That funding was approved in March, funded 25 miles of levee wall construction here in Hidalgo County. BROOKE GLADSTONE: Do you think you needed that, as someone who covers this issue down there? LORENZO ZAZUETA: No, if you talk to locals here, you know, the majority will tell you that we don't need more and we didn't need the ones that were built back in late 2000s. A lot of it was constructed tore through some of the natural landscapes that we have here that people used to use as hiking trails. What you see is, especially in Hidalgo, right along the border, there's border wall there and now you have atrophied landscape. So it used to be a refuge where people could walk, but now because of the wall people don't go back there. BROOKE GLADSTONE: The Democratic mayor of McAllen, Jim Darling, said 'it's the safest city in Texas.'. LORENZO ZAZUETA: He may be referring to the idea that we've had the same kind of flow for a long time. This isn't anything new for the people that live here. BROOKE GLADSTONE: It's the seventh safest city in the country. I was covering the coverage from New York and apparently one of the movie theaters in McAllen put that statistic up on its marquee. You think the president might have seen it? Did it surprise you that it was there? LORENZO ZAZUETA: It didn't surprise me because every time we do have politicians come down here, as a community, we do try to point that out. That there are no gunfights on the streets here. There is no spillover of cartel violence. I think earlier this year it was a city of McAllen Police Department released a stat that said that there is 30 year low in crime. So, it's a source of pride for a lot of us to say, 'I've never felt unsafe here in this city.' I think the community witnessed, for the last four and a half, five years, what it is that we're actually dealing with. And that is we have desperate people coming from Central America. They're coming here and they're not a burden on the city. They're not coming here to harm us. BROOKE GLADSTONE: And the citizens feel that way? Do they embrace them? LORENZO ZAZUETA: I think so. I think it's evident in how much support the respite center has gotten by the community. LORENZO ZAZUETA: I mean, a lot of the people who are working there are volunteers–and they have been since 2014. They understand what the national rhetoric is versus the reality of this place. And you know, Darling, you've mentioned he's a Democrat, but you don't get that feeling. There isn't a lot of partisan politics when it comes to the local politicians here. I never really even thought of him as a Democratic mayor. He's been very pragmatic in the way that he deals with these kinds of things when they come up. And I think the community really took heart to his message of we need to help these people who are arriving and have nowhere to go. BROOKE GLADSTONE: So to the extent that there is a crisis in McCaslin, it's that the detention centers where children are kept in, what some have called, subhuman conditions. These are centers operated by federal agencies not by the town. The city itself, as you describe it, sounds welcoming, utopian, practically Canadian. How close is McAllen to Mexico? LORENZO ZAZUETA: I could get to the Progreso bridge probably in 20 minutes. And, if I may add, that during the run up to the midterms when we were losing our minds about a caravan coming here that we knew wasn't going to come. I went down to the bridge and I just hung out around 4:00, 5:00 and the amount of people that were going into Mexico from this side, from the US side, to go see a dentist or a doctor, kids coming back from school going back into Progreso, Mexico to be back home with their families. The cars back and forth, this is a transnational community, this is every day. This is a weird stop if you're trying to make it look like there's a crisis on the border. LORENZO ZAZUETA: Because there's no evidence of that here. BROOKE GLADSTONE: Lorenzo, thank you very much. LORENZO ZAZUETA: Thanks for having me. BROOKE GLADSTONE: Lorenzo Zazueta-Castro covers immigration for The Monitor newspaper in McAllen, Texas.